Plastic lids for catering products fit bowls and serving trays to keep the food warm and sanitary at weddings and parties. All of our lids provide secure, see-through covers and keep foods fresh and attractive. Available in many shapes and sizes you're sure to find the perfect fit to many of our disposable trays, bowls, and tumblers. 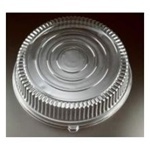 Our catering lids can be used for catering weddings, banquets, parties or for your everyday restaurant supplies. Emi Yoshi Round Dome Lid Clear - 12 in. Emi Yoshi Round Dome Lid Clear - 18 in. Disposable Plastic lids for covering plates and bowls at wholesale prices from the restaurant supply catering leader.